Ingels was born in Copenhagen, Denmark. He graduated in architecture from the Royal Danish Academy of Fine Arts, enrolling to learn cartooning but leaving in love with design. He continued studies at the Escola Tècnica Superior d'Arquitectura in Barcelona, and returned to Copenhagen to receive his diploma in 1999. 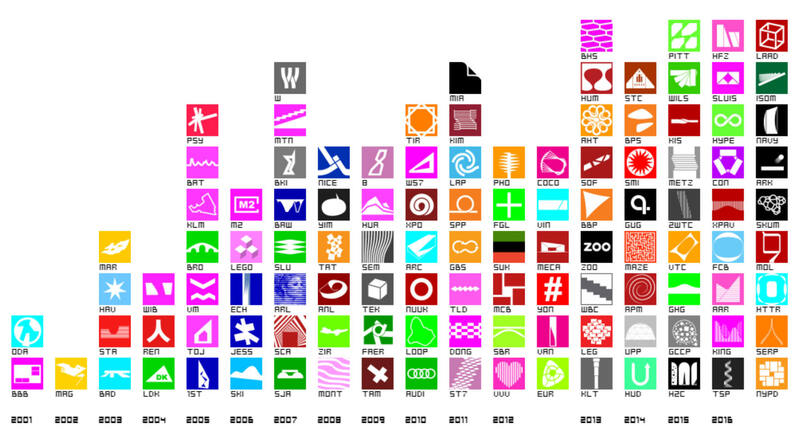 From 1998 to 2001, Ingels worked for Rem Koolhaas in Rotterdam on projects such as the Seattle Public Library. 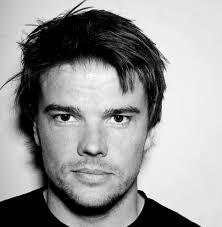 In 2001, he returned to Copenhagen and started the design firm PLOT with Belgian OMA colleague Julien de Smedt. 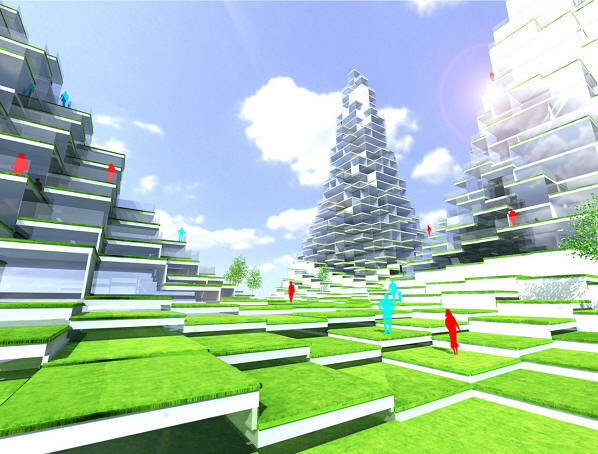 PLOT was disbanded at the end of 2005, and in 2006 Ingels created Bjarke Ingels Group (BIG) which grew to 400+ employees by 2016. 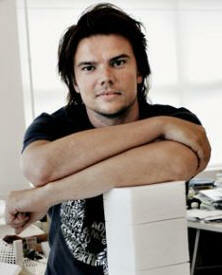 In addition, in 2009, Ingels became a co-founder of the KiBiSi design group, together with Jens Martin Skibsted and Lars Larsen. With interests in urban mobility, architectural illumination and personal electronics, KiBiSi designs bicycles, furniture, household objects and even aircraft, becoming one of Scandinavia's most influential design groups. Among many honors, Ingels won the 2001 and 2003 Henning Larsen Prizes; the 2002 Nykredit Architecture Prize; the 2010 European Prize for Architecture; and several US AIA awards. He has been a visiting professor at Rice, Harvard, Columbia, and Yale among other schools. He creates unique symbols for each project, whether built or not. Ingels's first book, Yes Is More: An Archicomic on Architectural Evolution, catalogued 30 projects from his practice through 2009. 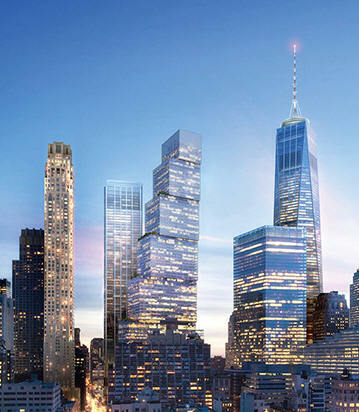 In 2012, Ingels moved to New York City. In 2015, Ingels bought an apartment in New York's Dumbo neighborhood. Bio adapted from Wikipedia. 2016 - Fora TV, Can the Dryline Save New York? 2003 - Islands Brygge Harbour Bath, Copenhagen, Denmark. Five open air pools. 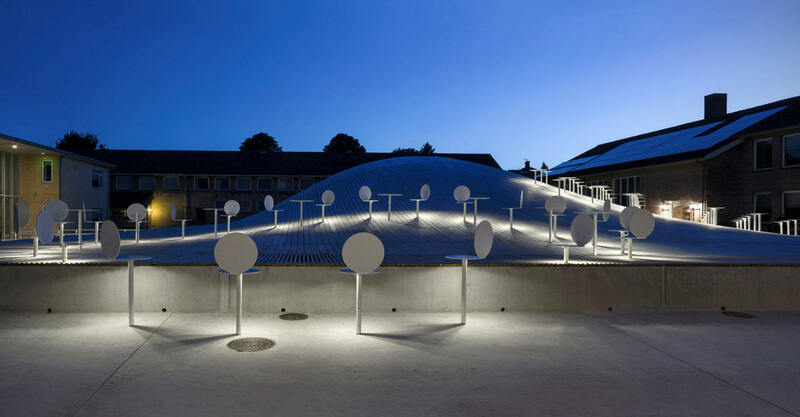 Awards include: 2007 International Olympic Committee Best Public Recreational Facility Honourable Mention; 2004 European Prize For Urban Public Space. 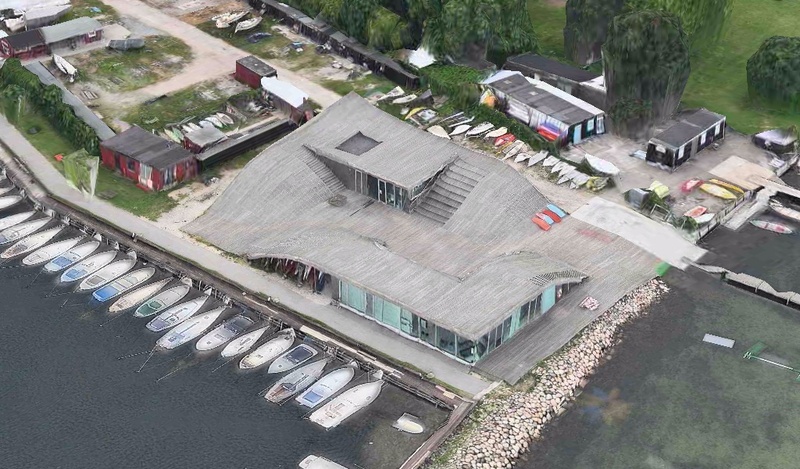 2004 - The Maritime Youth House, Amager, Sundby Harbour, Copenhagen, Denmark. Awards include: 2005 Mies Van Der Rohe Award Honourable Mention; 2004 European Architecture Award Luigi Cosenza; 2004 Copenhagen Award For Architecture; 2004 Ar+d Award. 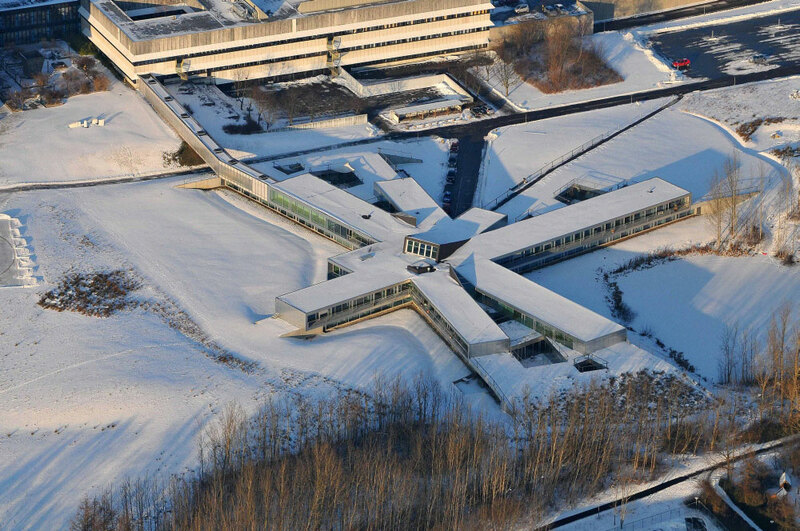 2005 - The Helsingor Psychiatric Hospital in Helsingor, Elsinore, Denmark, shaped like a snowflake. 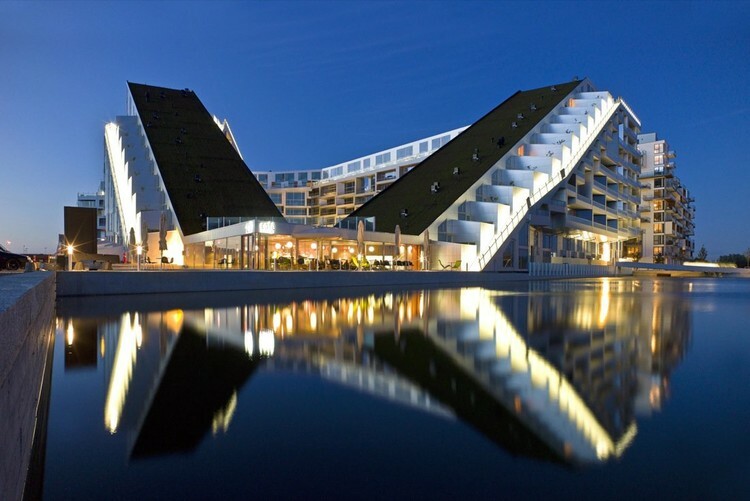 2005 - The VM Houses, Ørestads Boulevard 57-59, Copenhagen, Denmark. Inspired by Le Corbusier's Unité d'Habitation concept, Ingels designed two residential blocks of 225 units, in the shape of the letters V and M (as seen from the sky). 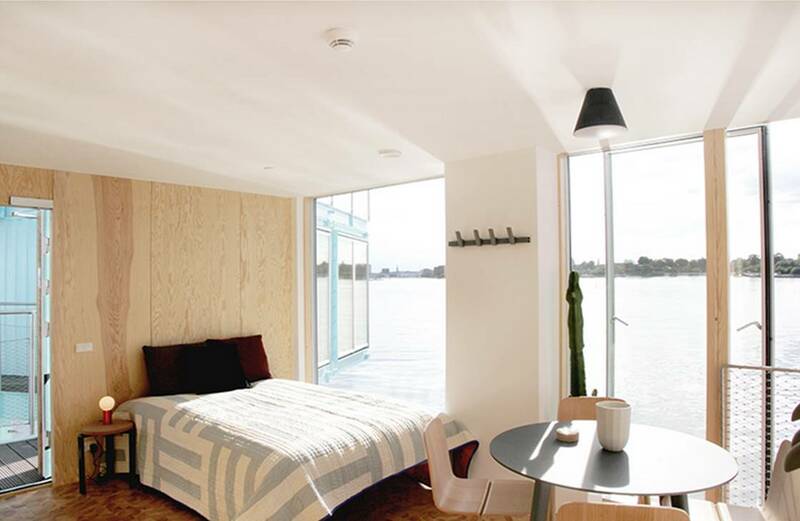 There are some 80 different types of apartment in the complex, adaptable to individual needs. Ingels lived there until 2008 when he moved into the adjacent Mountain Dwellings, below. Video. 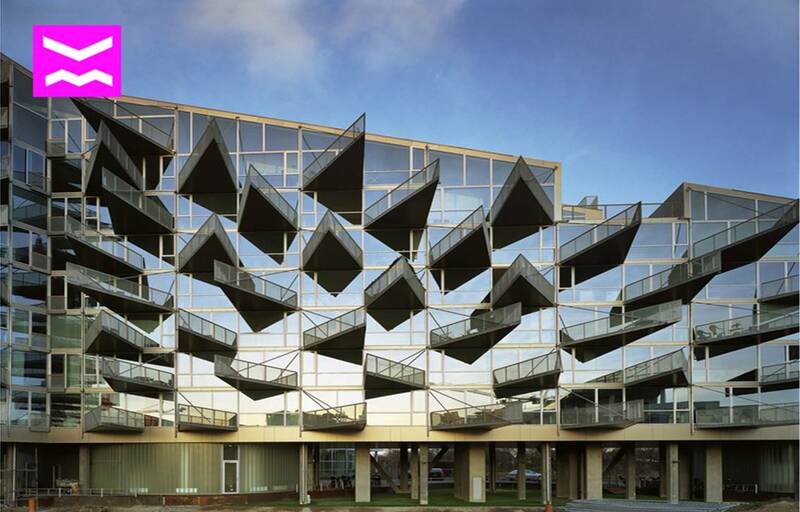 Won the 2007 Mies Van Der Rohe Award Honorable Mention; 2006 Forum Award Best Building In Scandinavia. 2005 - Tojhuset Apartments, Copenhagen, Denmark. Unbuilt. 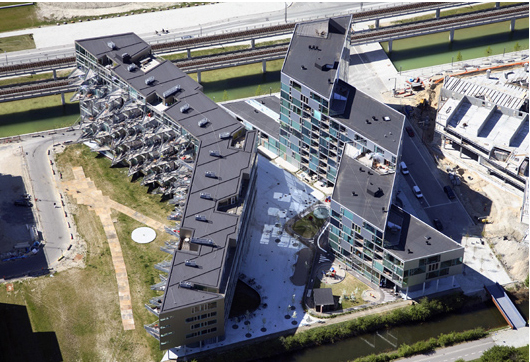 2006 - Lego Towers, housing in Copenhagen, Denmark. Unbuilt. 2006 - Escher Tower, Copenhagen, Denmark. 1000-room hotel. Unbuilt. 2007 - The Scala Tower, Copenhagen, Denmark. Unbuilt. 2007 - Sjakket Youth Center, Skaffervej 4, 2400 København NV, Denmark. Won the 2011 International Olympic Committee Ioc/iaks Silver Award; 2008 Contract World Best Interior In Education. Video. 2007 - The World Trade Center, Vilnius, Lithuania. Unbuilt. 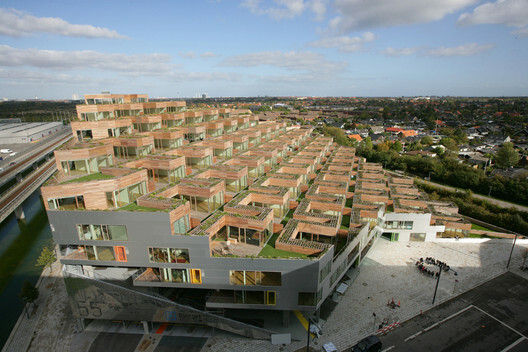 2008 - Mountain Dwellings, Ørestad, Copenhagen, Denmark. 2009 - The People's Building in Shanghai, China. Unbuilt. 2009 - The Tamayo Museum and Cultural Center, Atizapan, Mexico. Unbuilt. 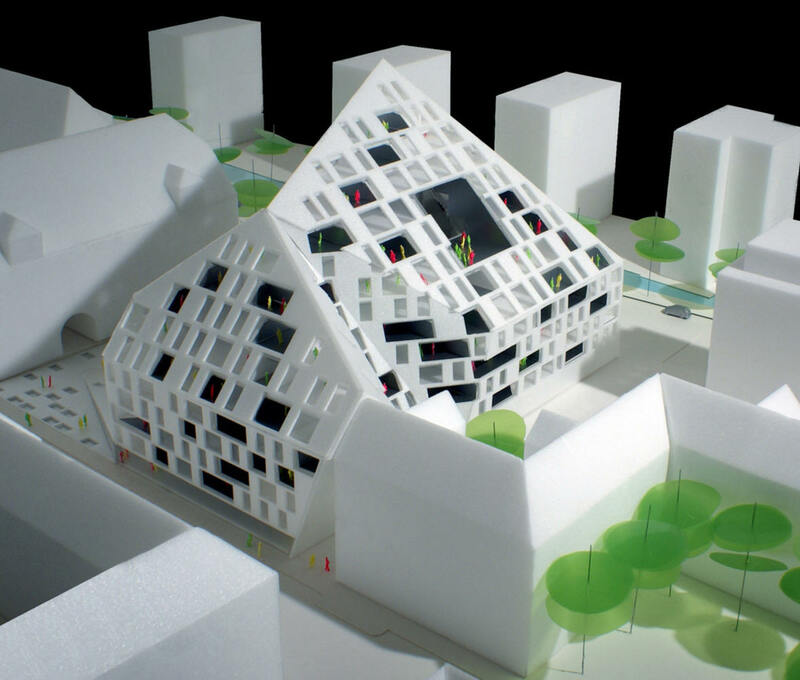 2009 - The Battery, a large multicultural multi-use complex featuring the first new mosque in Denmark. Unbuilt. 2010 - 8 House, Ørestad, Copenhagen, Denmark. At the time it was the largest private development undertaken in Scandinavia, combining retail with commercial row houses and apartments. 476 units. Video. 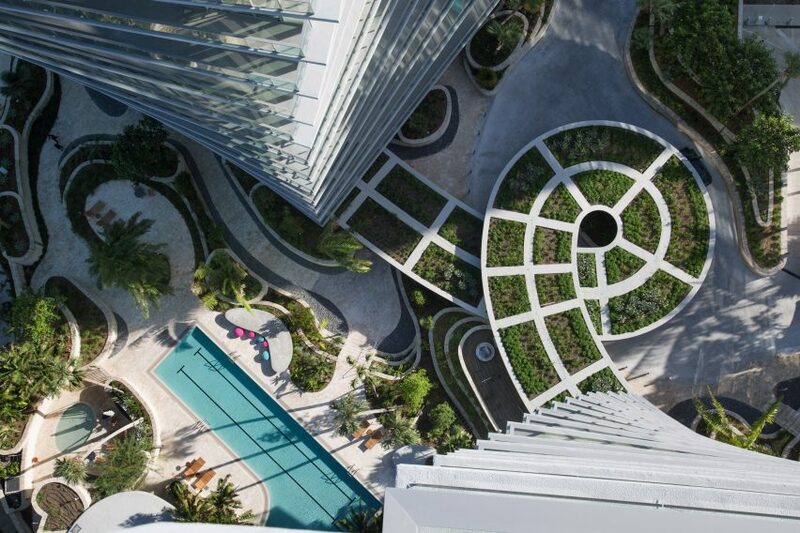 Won the 2012 AIA National Award (Best Housing); 2011 World Architecture Festival (Best Housing); 2010 Scandinavian Green Roof Award. 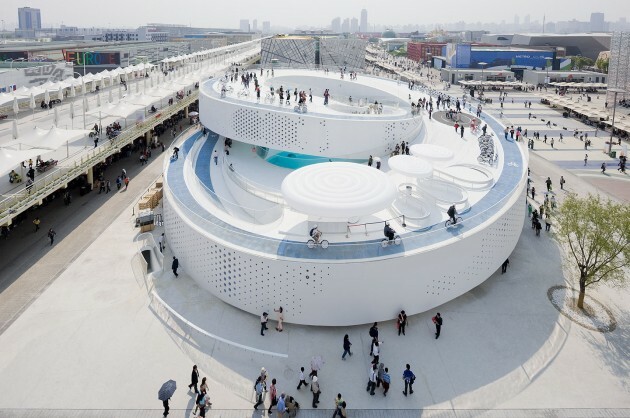 2010 - The Denmark Pavilion, World Expo 2010, Shanghai, China. The open-air 32,000 sf steel pavilion had a spiral bicycle path, accommodating up to 300 cyclists who experience Danish culture and ideas for sustainable urban development. You could also swim in 1 million gallons of water brought from Denmark and see the original Little Mermaid statue, not a copy, in that pool. Video. The statue returned to Denmark in November 2010. Awarded 2011 Detail Special Prize For Steel; 2010 Exhibitor Magazine Awards (Best Exterior Design). 2010 - Converting an oil industry wasteland into a zero-emission resort, Zira Island off the coast of Baku, Azerbaijan. Unbuilt. 2011 - Superkilen, a public park in Copenhagen, Denmark. 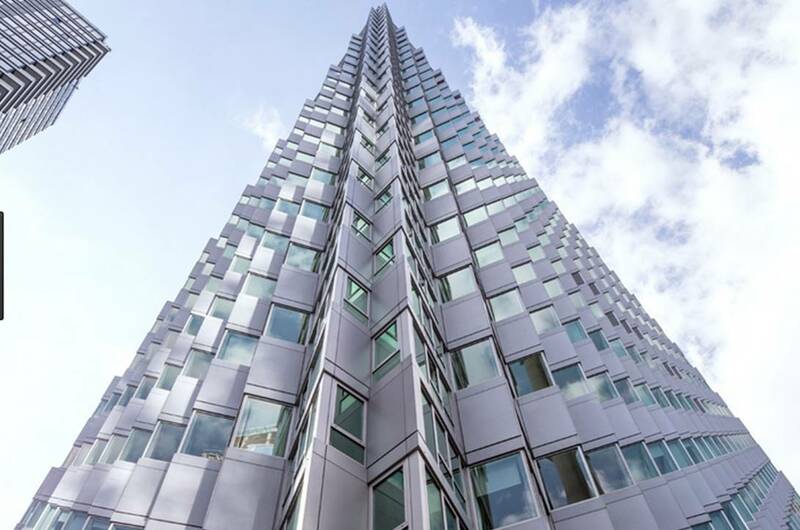 Awards include 2013 Civic Trust Award, UK; 2013 AIA Honor Award for Regional & Urban Design; 2013 ArchDaily Buildings of the Year Award; 2013 Architizer A+ Awards; 2012 Architect Magazine Annual Design Review Award. Video. 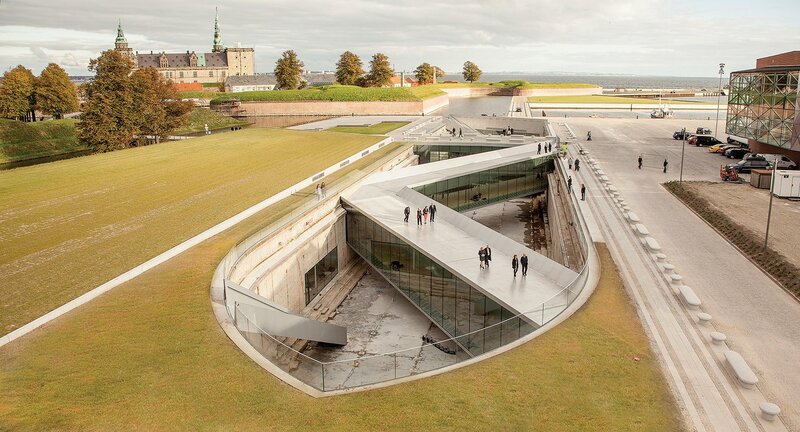 2013 - The Danish Maritime Museum, Helsingør, Denmark. 2013 - The Tallinn City Hall, Tallinn, Estonia. Commissioned 2009. Unbuilt. Cancelled by the City because Ingels asked for an additional million euros. 2013 - Gammel Hellerup High School in Hellerup, Denmark — a handball court and a larger arts and sports extension. Ingels went to high school there. 2013 - Ingels won the Europa City Development Competition, Triangle de Gonesse, France. Unbuilt. 2014 - 20-year plan for the Smithsonian Institution campus in Washington DC. Commissioned 2013. Unbuilt. 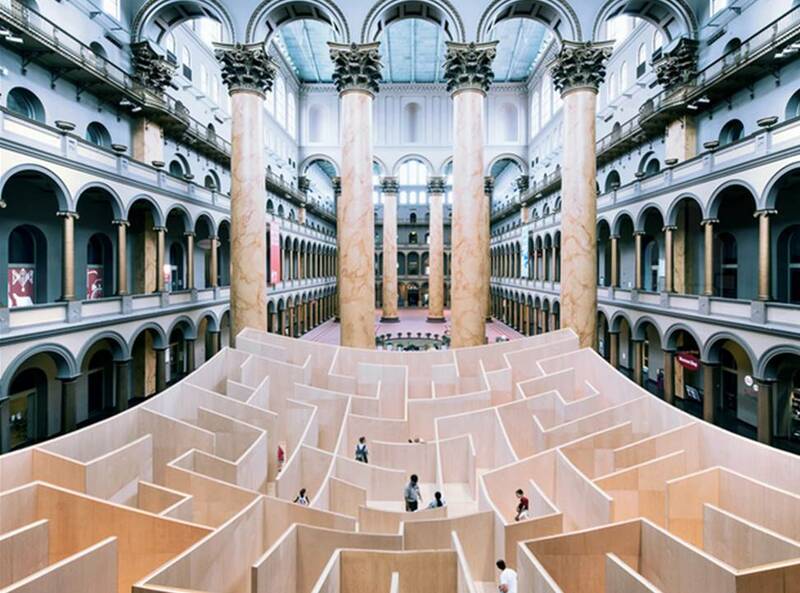 2014 - The Big Maze at The National Building Museum, 401 F St NW, Washington DC. Temporary exhibition. Video. 2016 - HFZ Towers, 76 11th Avenue, New York NY. Unbuilt. 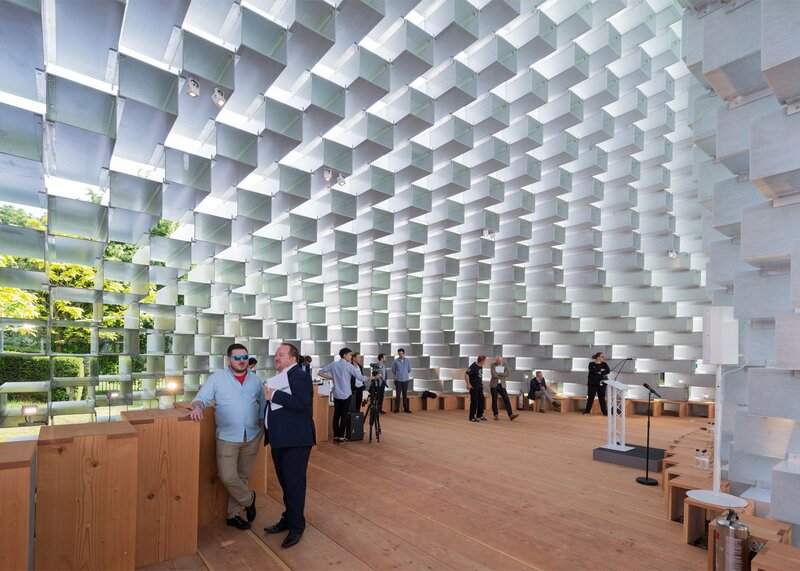 2016 - Temporary exhibition at the Serpentine Pavilion, Kensington Gardens, London. 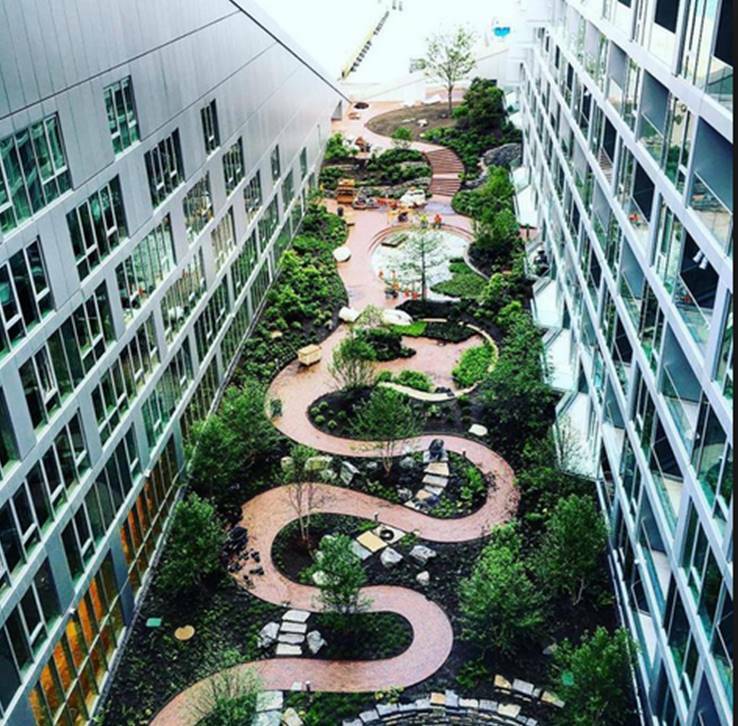 2016 - 1200 Intrepid Avenue, Navy Yard, Philadelphia PA.
2016 - VIA 57 West, West 57th Street, New York NY. Ingels’ first completed residential building in North America – and his first completed skyscraper anywhere. 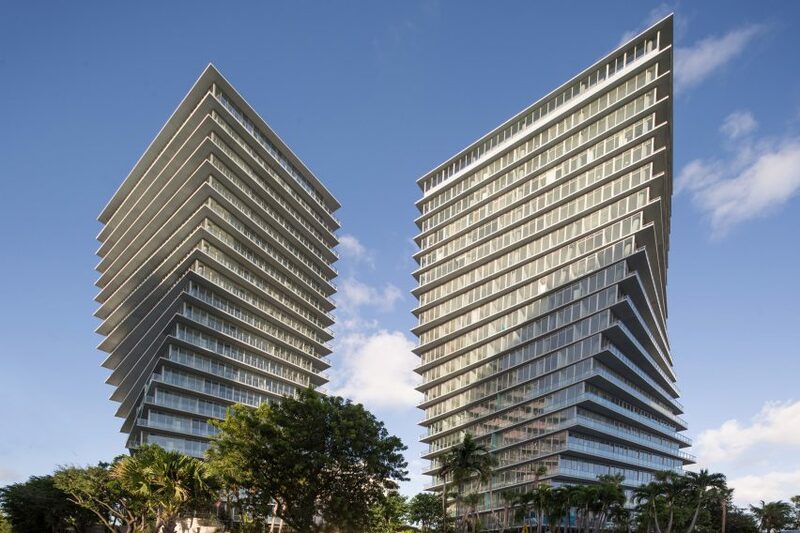 Developed by Durst Fetner Residential. Video. 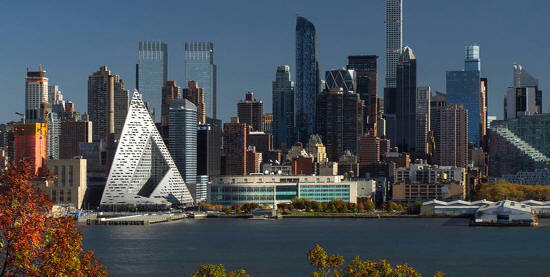 Won the 2015 P/A Progressive Architecture Citation Award; 2012 NY AIA Merit Award Future Award. 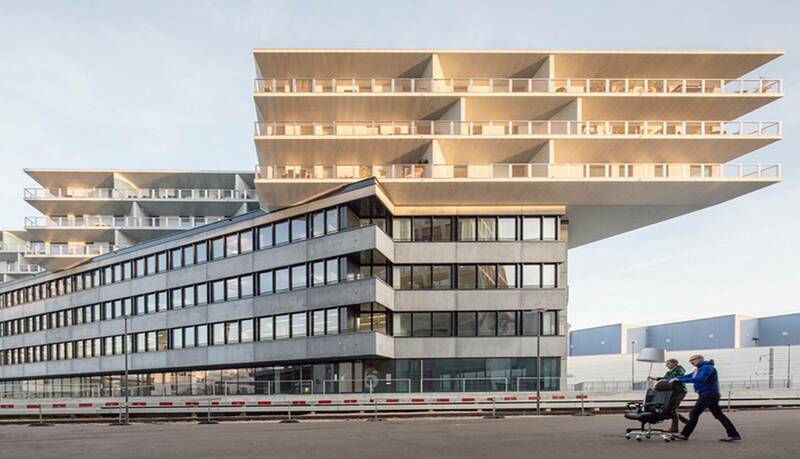 2016 - M2 Typehouse, Denmark. Location strangely unknown. Developed for home builder M2. From the outside the house appears as a hill in the landscape. A second hill provides shelter for cars and garden equipment. 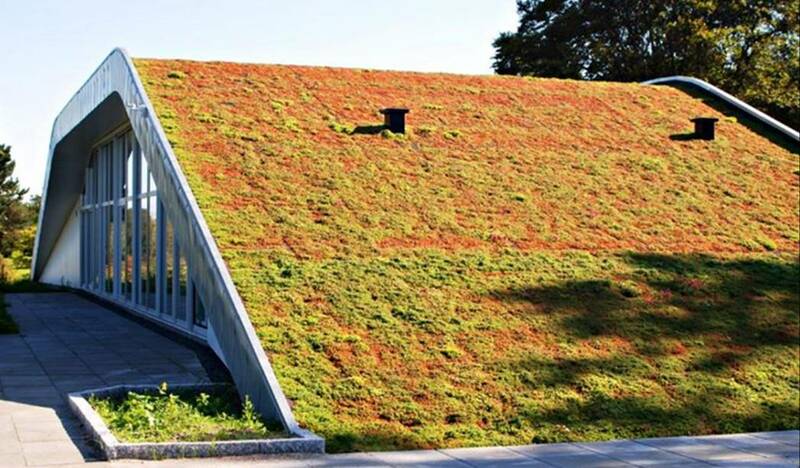 The roof is covered with sedum, a robust grass, which requires a very low construction height and maintenance. 2016 - Coconut Grove at Grand Bay, 2675 South Bayshore Drive, Miami FL. Video. 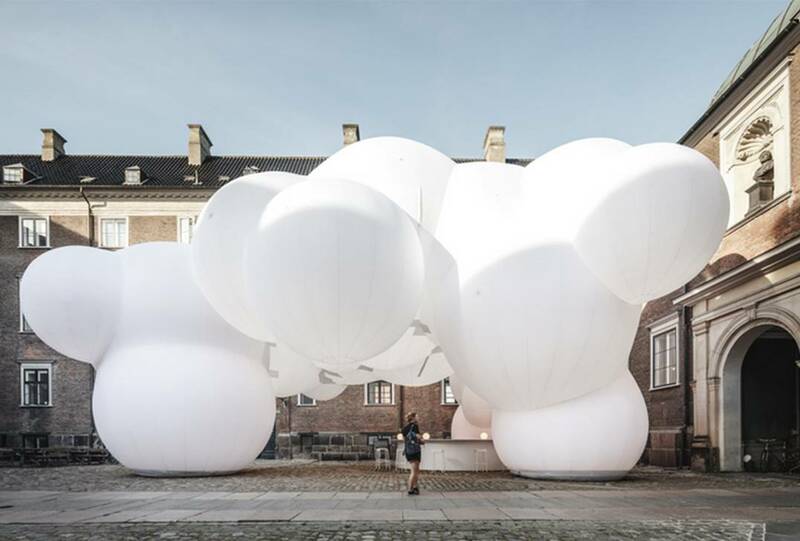 2016 - The SKUM Pavilion, aka FOAM Pavilion, bubbles filled with air powered by two wind turbines. Fully inflated in seven minutes, creating a permanent structure that’s also transportable. 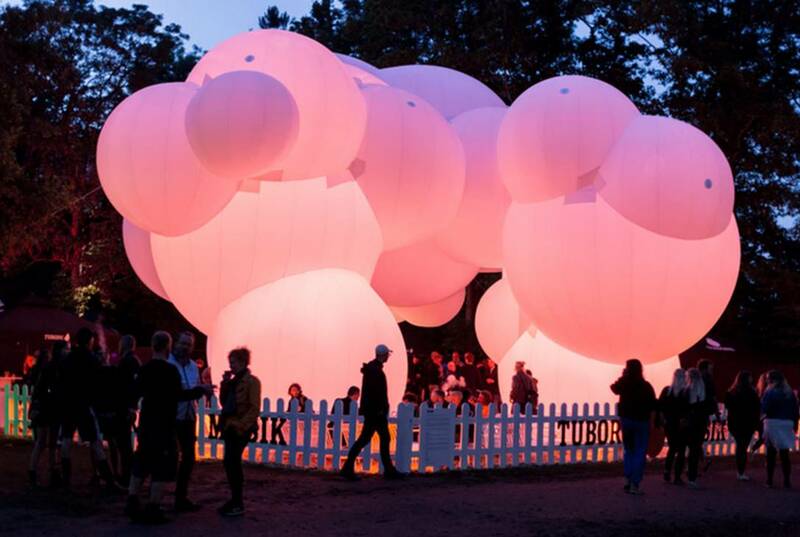 Debuting as a VIP bar at Roskilde Festival, the pavilion features color-changing LED lights. Video. 2016 - The Urban Rigger, Copenhagen Harbor, Denmark. 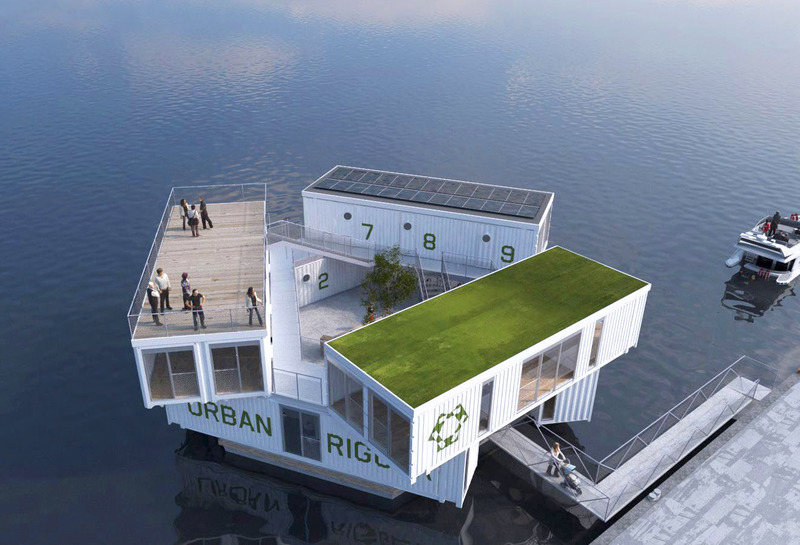 Student housing made from shipping containers, it is a huge houseboat! Website. 2017 - Amager Bakke, Copenhagen, Denmark. A unique combination of power plant and ski area. Commmissioned 2011. 2017 - The Lego House, Billund, Denmark. A visitor's center for LEGO. Commissioned 2014. 2017 - Two World Trade Center, New York NY. 2017 - Transitlager, Basel, Switzerland. Photo by Laurian Ghinitoiu. A new building stacked on top of an existing warehouse building in the city’s Dreispitz district. The uppermost floors contain residences. 2018 - Washington Redskins Stadium, surrounded by a moat instead of a fence, where tailgaters will be able to kayak or hang out on a man-made beach. 2018 - The DryLine, an integrated flood protection system, created by the Department of Housing and Urban Development in the wake of Hurricane Sandy. Commissioned 2014. 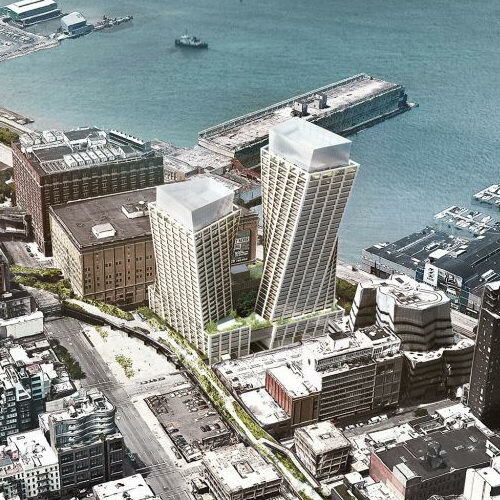 The DryLine will stretch Manhattan's shoreline on the Lower East Side, with a landscaped flood barrier in East River Park, enhanced pedestrian bridges over the FDR drive, and floodwalls north of East 14th Street. 2018 - Google North Bayshore Headquarters, Mountain View CA. 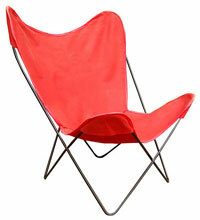 Designed with Thomas Heatherwick. Commissioned 2015. 2020 - The Hyperloop, aka Hyperloop One. A magnetically levitated, high speed, elevated train system will be operational in Dubai in time for the World's Fair, maybe.